Pictured left to right: Dr. Shiraz Hyder, MD, MMM, FACPE, VP Medical Affairs, St. Alexius Medical Center; Sister Nancy Miller, Prioress of Annunciation Monastery and President of the Board of St. Alexius Medical Center; Dr. David Hayes, Medical Director, Mayo Clinic Care Network; Gary P. Miller, President/CEO, St. Alexius Medical Center; and John Castleberry, Board of Directors Chair, St. Alexius Medical Center. As sponsors of St. Alexius Medical Center, we heartily congratulate St. Alexius Medical Center on becoming a member of the May Clinic Care Network! 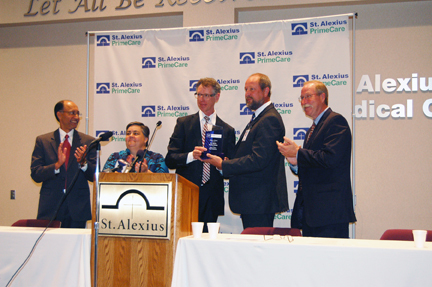 This exciting announcement was made at a St. Alexius press conference this morning. We keep you, and those you serve, in our prayers!